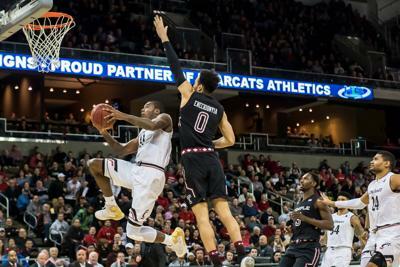 Another AAC nail biter took place on Sunday at the Liacouras Center as the Cincinnati Bearcats took down the Temple Owls in a close finish, 72-68. The Bearcats were able to get a late steal and free throw despite a Shizz Alston, Jr. three-pointer that brought the Owls within three in the closing moments. Cincinnati played a strong final five minutes as they were able to get their first lead of the game, and never looked back. A big part of the game came down to rebounding the ball which proved to be difficult for Temple’s big men. The Owls were outrebounded 46-22, which certainly did not help their chances at winning the game. The Owls did lead by 10 at the start of the second half, but the comeback from the Bearcats proved to be the difference maker in their big conference win. Temple tried to get back into things in the final minutes, tying it up late, but Jarron Cumberland was able to keep his team in front, behind his monster 25 points and eight rebounds. The Owls lacked the much-needed fire in the second half, against a team who physically outplayed them. The spark is usually present for the Owls late in games, gaining steals and hitting the clutch shots, however, this time Cincinnati was the team getting the shots to fall and getting a few lucky bounces. Despite losing, Temple got a huge game out of J.P. Moorman who contributed 20 points off of the bench. However, he was the only one to score off of the bench for the Owls. Temple also got 18 from Alston, 16 from Quinton Rose and 11 from Nate Pierre-Louis. More notably, Temple’s big men, De’Vondre Perry, and Ernest Aflakpui were rather quiet in this one as Aflakpui got on the stat sheet with three points, and Perry went scoreless. Temple fell to 15-5 on the season, and 5-2 in the conference, while Cincinnati improved to 18-3 and 7-1 in the conference. Next up for the Owls is a rematch with Houston on Thursday, who is currently ranked at #13 in the country. This time the game is on their home court. The last time the teams faced off, Temple won on the final play, 73-69.